The Obama administration is working to release “dozens” of Guantanamo prisoners in the coming months, citing fears of possible obstruction by lawmakers to expedite the closing of the notorious camp. The first 10 prisoners may be released as early as June. According to the Washington Post, the White House has ordered the Pentagon to resettle up to 57 prisoners currently held at Guantanamo by the end of 2015. If the Republican-controlled Congress passes legislation blocking future releases, White House officials are “exploring options for the unilateral closure of the prison” and moving detainees into the US, the paper says. 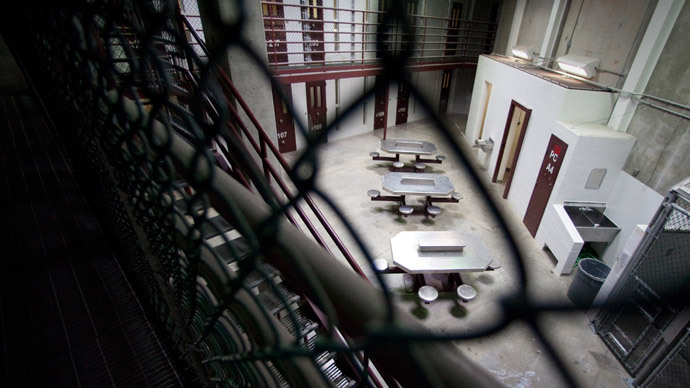 Once the population in Guantanamo shrinks to 65 prisoners, the White House may argue for their transfer to secure facilities inside the US, as well as closure of the notorious detention camp, reported MSNBC. There are currently 122 prisoners in Guantanamo Bay camps. Of the 57 approved for release, 48 are Yemeni nationals. Since they cannot be repatriated due to “security conditions in their war-torn homeland,” Pentagon officials speaking to the Post on condition of anonymity said the US government was in negotiations with third countries to accept them. “It’s going to take high-level leadership,” said one Pentagon official. A Saudi-led coalition began bombing Yemen in March, after the deposed president Abd-Rabbu Mansour Hadi fled the country. Riyadh says Houthi anti-government forces are backed by Iran, a claim both the rebels and Tehran deny. The last transfer out of Guantanamo was in January, when four Yemenis were sent to Oman and another to Estonia. Some of the prisoners were cleared for release years ago, but the Pentagon dragged its feet on letting them go, according to human rights advocates and lawyers representing the detainees. Among the prisoners expected to be set free this summer are Ahmed Ould Abdel al-Aziz, a Mauritanian national approved for release in 2009, and Younis Abdurrahman Chekkouri, a Moroccan who could have been freed in 2010. Neither had been charged with a crime. During his visit to Washington in January, UK Prime Minister David Cameron personally lobbied for the release of Shaker Aamer, a British resident, accused by US officials of being a senior Al-Qaeda operative. “We are confident that the US government understands the seriousness of the UK’s request for Mr. Aamer’s release,” a spokesperson for the British Embassy in Washington said. An organization representing many of the Guantanamo inmates cautiously praised the White House position, but noted that the Pentagon had been slow to release inmates. The Post reported that recently appointed Defense Secretary Ashton Carter is expected to approve the repatriation of Chekkouri and al-Aziz, and the transfer of six Yemenis to a third country, in the coming weeks. Carter replaced Chuck Hagel at the helm of the Pentagon in February, the paper noted, adding that Hagel’s reluctance to approve the releases reportedly “caused friction” with the White House and led to his abrupt resignation.